This photograph has been scaled down; full resolution photograph is available here (3,839 by 1,967 pixels). This is one of only 2 actual shots of the 3rd 'initial sister ship' of the Yamato Class Battleships. The other shot is in the 'hard bound book' about her one cruise and appears to be a photo taken from a B-29, as she was not moving in the photo, and actually the photo analizers didn't even know of her existance, when the photo was initially taken. They were surprised of the massiveness of the ship, and that there was even a carrier, in the area. It was shortly after that picture, the overhead, that the naval officials decided to move her. The overflights. It would be interesting if anyone would ever actually find and photograph the wreck. 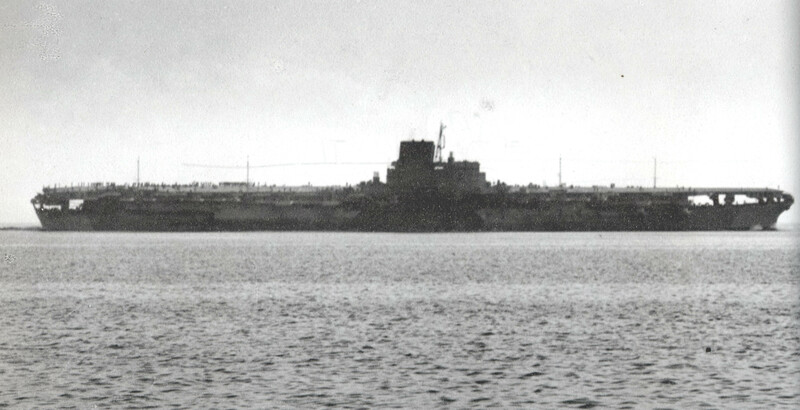 At the time of her existance, she was the largest aircraft carrier (being used only to ferry aircraft) ever built, over 65,000+ tons, and well over 800' in length. The Forrestal Class of the '50's were the first ones to exceed. Even the Midway, Coral Sea, FDR Class was smaller than she was. Her initial construction was halted, after the opening of hostilities, and because of carrier losses in the early part, she was stripped back down to the main deck and converted. In fact, it is quite likely, that this shot was taken on her only cruise, as she was being moved for safety reasons to avvoid the high level B-29 Raids that were increasing. She was headed for Japans' Inland Sea when the USS ARCHERFISH by Joe Enright, caught her with a 'long range' spread of 4 torpedos, and eventually because of poor counter flooding techniques, she was lost with heavy loss of life. I em in Poland. Tylko po polsku ! Gdzie mogę kupić modele "Shinano" i "Yamato" ? While the Japanese government may not like it I would like to see the wreck of the Shinano explored. I would like to see it to but your right the japanese gov would not like if you did. So it is cool and big too. Unless they have something to hide, they shouldn't have any objections. It just remains for the wreck to be found. I would like to see something of the Yamato wreckage. I read that it had been found and explored a little in the 80's. The I400 and I401 wrecks were VERY interesting. we need to explore and see the wrecks 1.shinano 2.musashi 3.sharnhorst 4.akagi 5.kaga 6.any remaining japanese ww2 carriers of the midway battle. I want to see them too. Scharnhorst was found back in 2003. SHe lies almost upside down with her bow blown off. A piece of Kaga's wreckage was found in the early 2000s, but not the whole thing. Exploring a wreck is disrespectful and a desecration of a Naval Grave. It's the same thing as digging up a casket. Leave those sailors rest in peace who sacrificed their lives in a lost cause! Bismarck & Hood have been explored tastefully and with all due respect for their brave crews--Why not others? What was the paint scheme of this carrier? I'm building the model of it and I can't fine any color pics of it. If any one knows please help. Thanks! Explore all the wrecks from WW II that can be found....but with respect for those who perished. If governments allow digging up of ancient burial sites and remains examined for "scientific research", then do the same to the "Gallant Ladies" who died, for either side. Like it or not, these ships are a part of the world's history. We dived on the USS ARIZONA to remove bodies and ascertain the explosion and its effects. I personally respect greatly the men and women who gave their all, irrespective of their nationality and/or beliefs. My particular ship of interest is the USS iNDIANAPOLIS. So much has been conjectured and blamed on her crew and captain. Perhaps, if the wreck is found, these allegations by involved parties can be solved and the crew gain a measure of peace.